Been to Cape Three Points? 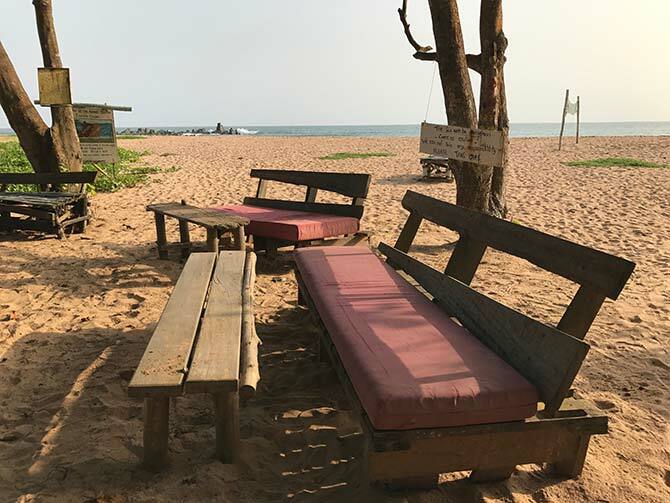 Cape Three Points may be Ghana’s most difficult beach to get to. Once there you are in for a treat, but prepare for a long, bumpy journey. Cape Three Points is 1 hours drive from Agona and nearly 2 hours from Takoradi. Take a taxi directly from Takoradi or Agona. Agree on price first. Alternatively, take the Cape Three Points tro-tro from Agona (morning or early afternoon). 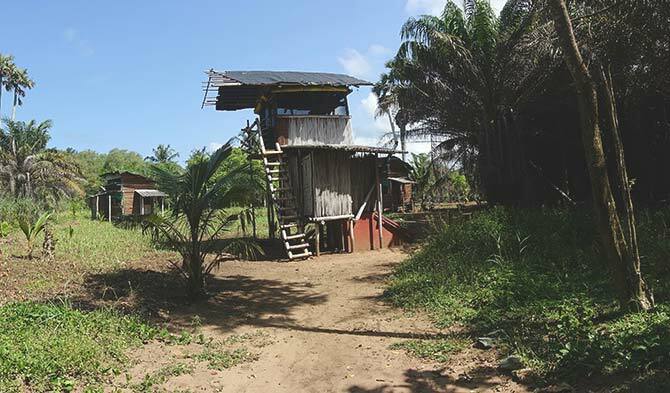 If you miss the last tro-tro from Agona, take a tro-tro to Akwidaa and walk (1½ hour) or try to hire a local motorcycle or contact your lodge. The road goes from bad to terrible during heavy rains, and not all taxi drivers will agree to take you! Be careful of rip-currents and undertows – don’t swim alone! When you step off the tro-tro in Cape Three Points Village, you feel like you have come to the end of the world. Actually you are smack in the centre! At least if you go by Earth’s geographical coordinates. Against a small fee, you can enter the lighthouse and get 360° views of the surroundings. Cape Three Points Village is a small fishing village. Don’t miss a walk down to the shore, where you will witness the life of fishermen as they maintain fishing nets, push wooden canoes in and out of the water, and play games as they wait for the right fishing conditions. The residents of Cape Three Points are welcoming, but you will not find many facilities here. 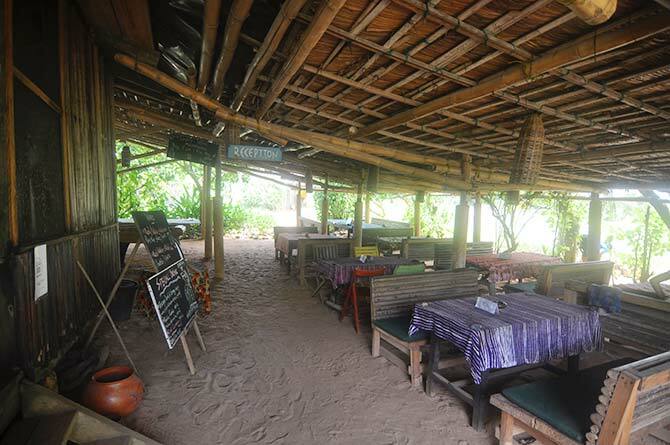 There are two very basic bars in the village, but no formal restaurants or accommodation options. 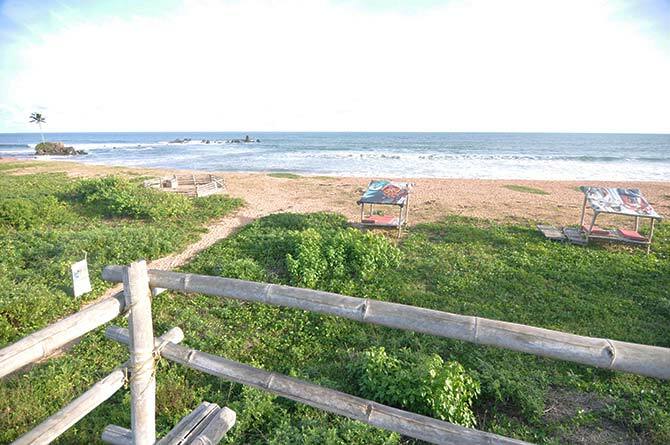 By far the most people who visit Cape Three Points Village stay at the nearby Escape3Points Ecoldoge, which is located 20 minutes walk along the beach from the village. Cape Three Points lighthouse – this is the nearest land point to 0° Latitude, 0° Longitude. 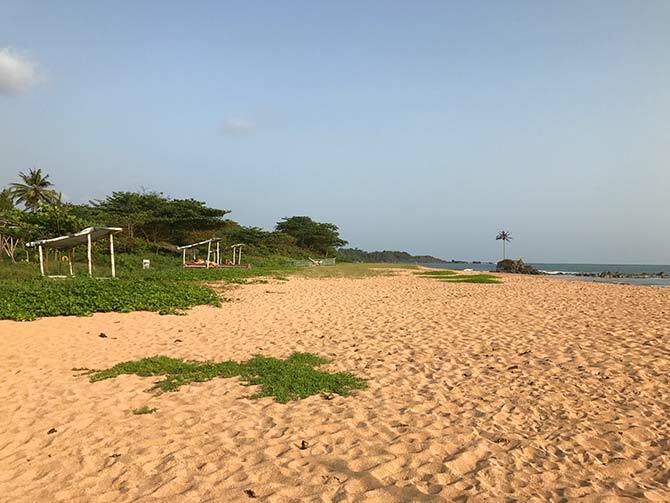 The Cape Three Points beach stretches for almost 2 km, and is arguably the most clean beach in Ghana, especially in front of the Escape3Points Ecolodge. You will never find many people on the beach. A few local fishermen or school kids now and then, and then guests from the lodge. You can easily find your own lonely spot on the beach with no one else in sight. The further east you walk on the beach, the more isolated it feels. There are a couple of bays that will take you straight into a Robinson Crusoe setting. The sea bed is sandy with rocky sections here and there. Standing on the beach, there is no land obstructing the sea all the way down to Antartica. The sea is often rough. You do not go swimming here (unless you swim out beyond the braking waves), you fight the waves. This is fantastic if you love body surfing and big waves, but less so if you are inexperienced in rough waters. Educate yourself on how to act should you be caught in a rip current, and do not swim alone. Other than swimming and surfing, there are plenty of activity options in the area. Most of these can be organised through Escape3Points Ecolodge. 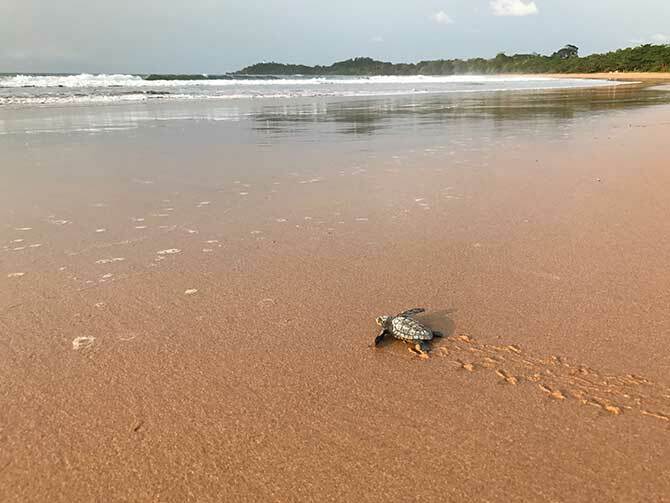 Examples are mountain biking in the rubber plantations, a mangrove canoe trip from nearby Akwidaa, a batik workshop, drumming lessons, and a guided visit to the Cape Three Points Lighthouse. 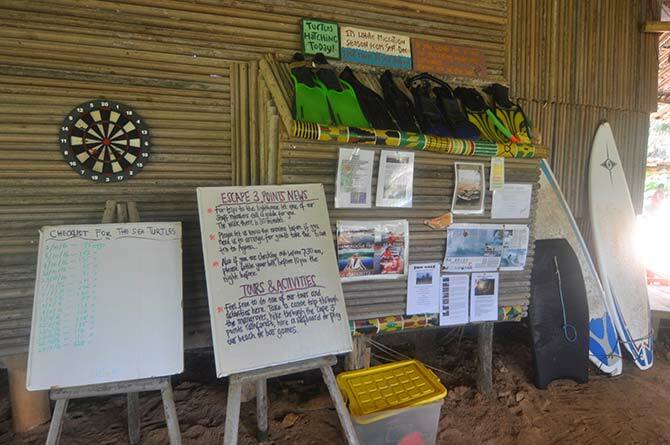 Although there are alternatives, Escape3Points Ecolodge is the only proper accommodation option at Cape Three Points. 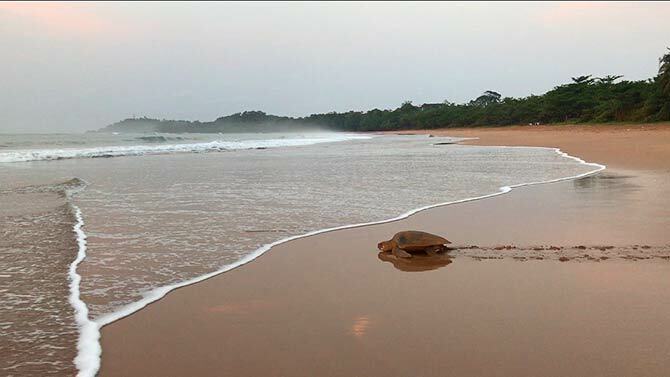 Luckily, it is one of Ghana’s best if you are a nature and beach-lover. The lodge has 10 chalets with private bathrooms and a 10-bed dormitory (bunkbeds). 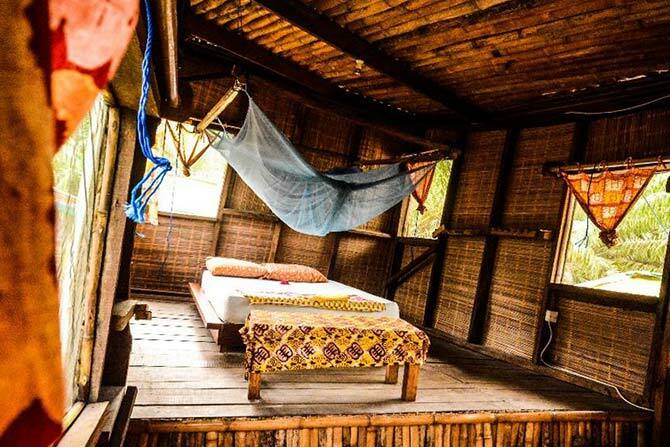 All chalets are built from natural materials such as bamboo and raffia and each has a unique architecture, so do a little of research before you choose. There is no luxury here. 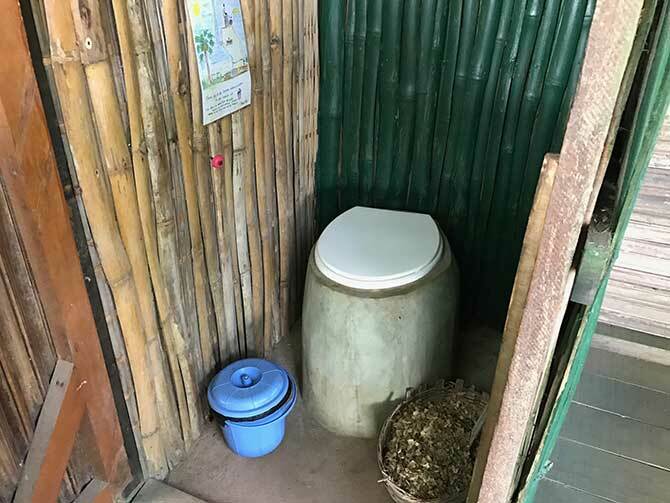 You shower in traditional scoop-style fashion, your room ventilation is the natural sea breeze, and the bathrooms are fitted with composting toilets. For some it takes a day or two to get used to, but the vast majority absolutely love this lodge and come back again and again. Staff is welcoming and engaging, not something you can take for granted in Ghana. Escape is off-the-grid relying on solar power. 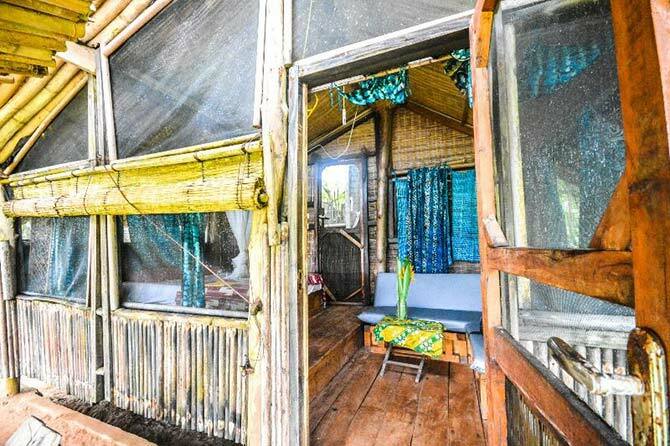 It has its own organic gardens and the lodge up-cycles materials in new creative ways. 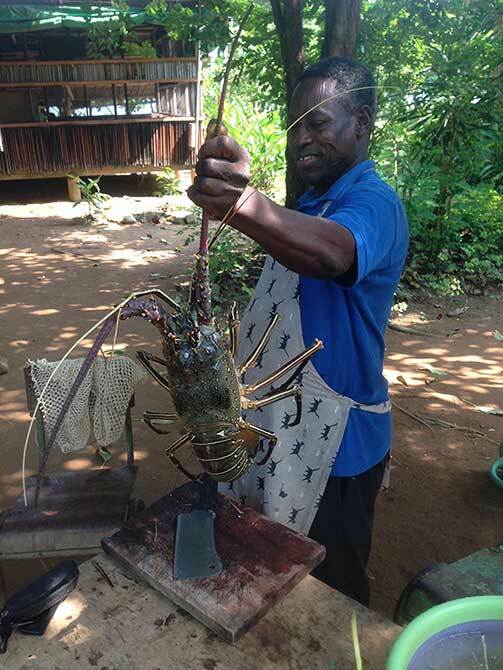 The restaurant serves western and Ghanaian food – often with newly caught seafood. There is no a la carte menu, but a daily menu with a couple of choices updated daily. 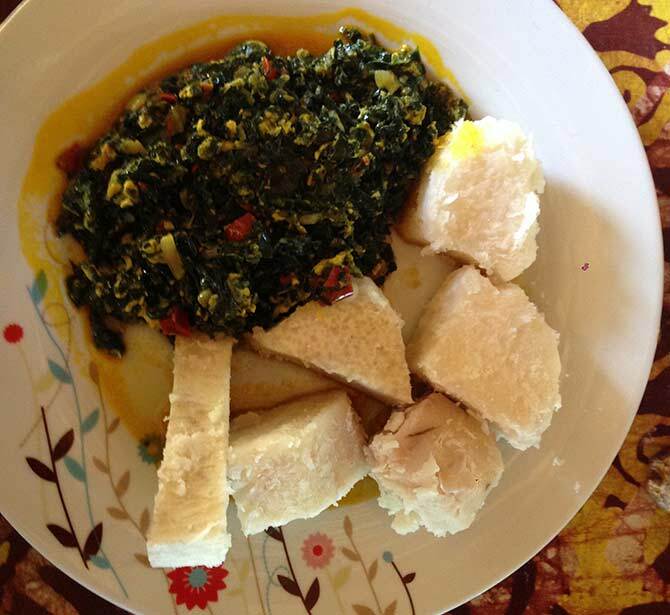 The food is on the expensive end by Ghanaian standards, but the portions are healthy-sized, and bear in mind that everything that is not produced locally has to be transported far. 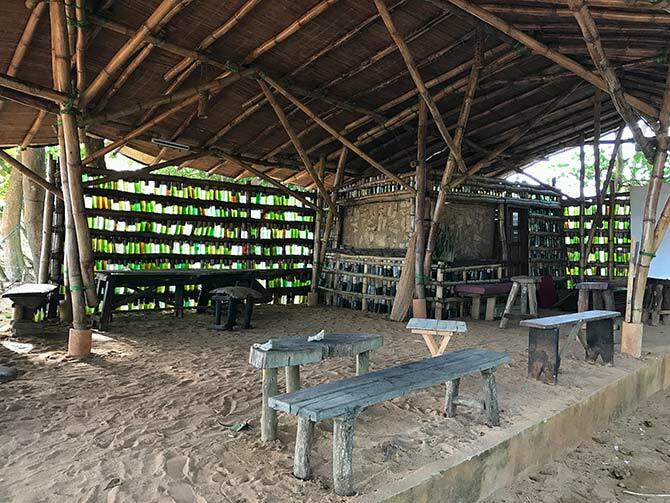 The bar at Ecape3Points Ecolodge is very well-stocked, and especially the selection of home-made akpeteshie with multiple flavours is impressive. Let the exceptional bar managers help you in choosing. Every now and then, the beach bar opens up complete with bonfire and music (sometimes live drumming shows). 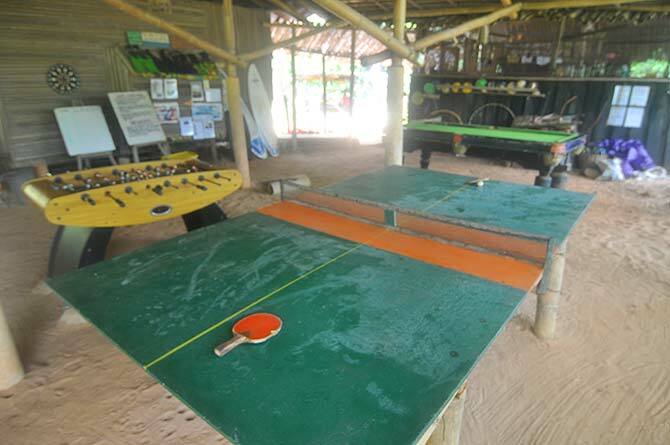 Escape has board games, beach games, table tennis, a pool table, a fussball (kicker) table, a turtle conservation programme, and surfboards for rent. 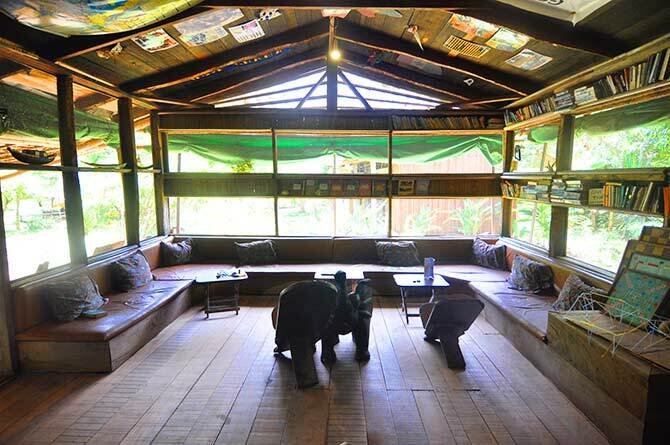 There is a lot more to be said about this inspiring lodge, leading the way in sustainable tourism. Put simply, this is a must-visit when you are in Ghana.